I've talked about my sisters on the blog many times before, but today I want to focus on my sisters-in-law. Erin and Katelyn have been absolute rocks for me the past several months. Not only were they some of my constant companions during my maternity leave (and part of the reason it was so hard to go back! ), but even though I'm not around to play with them all day, they're taking care of Brecken. Kate's on official Brecken duty most days, but Erin has filled in numerous times and makes sure that B gets plenty of quality time with her cousin Eoin. Long story short, they're fantastic aunts, whom I love to watch love Brecken, and they're some of my dearest friends...except sisters, which is even better! Among their many talents is also a major ability to make and decorate cakes...both of them! You might remember the Where the Wild Things Are Cake that Kate & I made for Erin's baby shower, or the Sprinkle Cake they made for mine. Those are just two of the many elaborate cakes I've seen these girls make, sometimes for no special occasion except that it's family dinner and we all love cake! Believe it or not they didn't make this cake (theirs would be much prettier!). It was all me, which is why the frosting job isn't totally picture perfect! 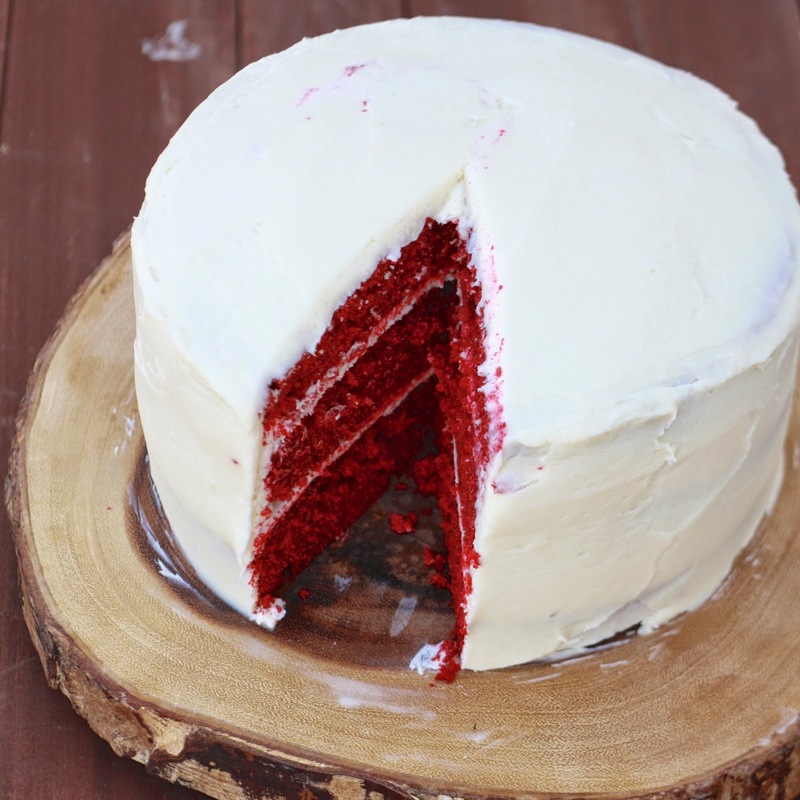 I couldn't resist trying a new recipe, however, and lucky for me, Bridget had already done the grunt work of finding the best red velvet cake ever. I went with her recommendation and was pleased to find that it was indeed the best red velvet cake I've ever had! 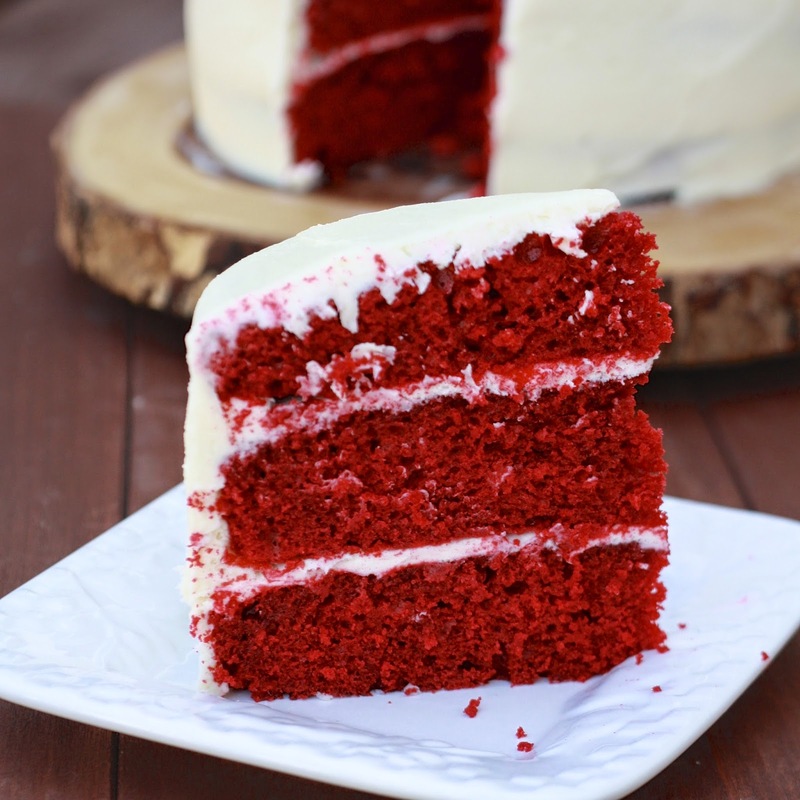 This cake is perfect as is--I wouldn't do a thing to change it and I dare you to find a better red velvet recipe! Now quick, find something or someone (maybe YOUR sister-in-law!) to celebrate so you have an excuse to make this! 1. To make the cake, preheat the oven to 350F. Grease and flour three 8-inch cake pans and set aside. 2. Sift together the flour, sugar, baking soda, cocoa, and salt in a medium bowl. In a large bowl, use an electric mixer to beat the eggs, oil, buttermilk, food coloring, vinegar, and vanilla until combined. Mix in dry ingredients, beating until smooth (about 2 minutes). 3. Divide batter evenly between the three prepared pans. Bake cakes, rotating halfway through, for 25-30 minutes, until an inserted toothpick (in the center of the cakes) comes out clean. 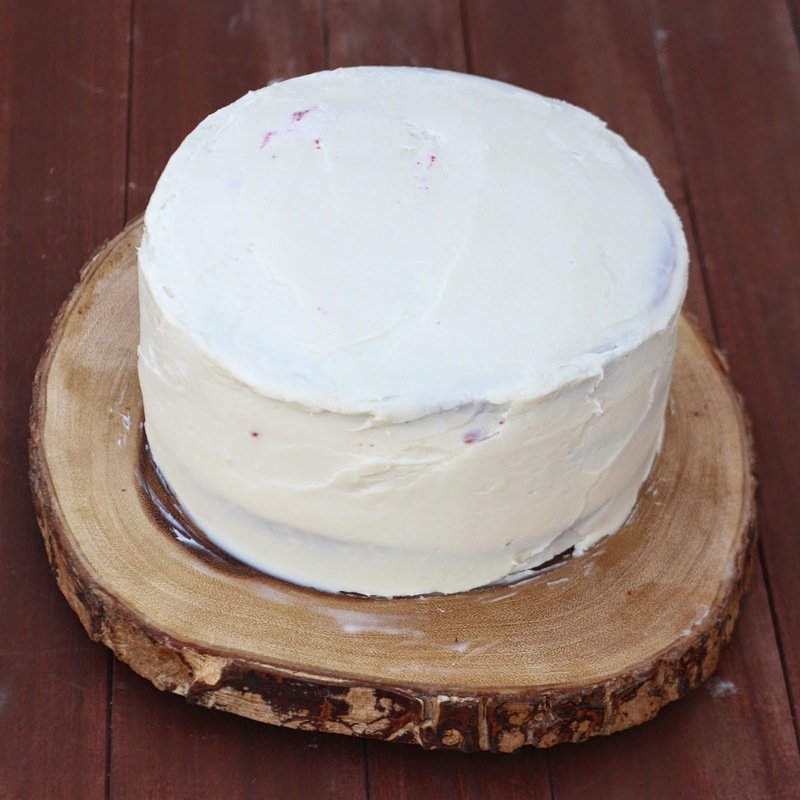 Allow cakes to cool for 5 minutes before inverting onto cooling racks to cool completely. If desired, wrap well and freeze until solid for easier frosting application. 4. For the frosting, beat the cream cheese, butter, and vanilla in the bowl of an electric mixer until combined. Beat in confectioners' sugar for 5-7 minutes, until light and fluffy. 5. 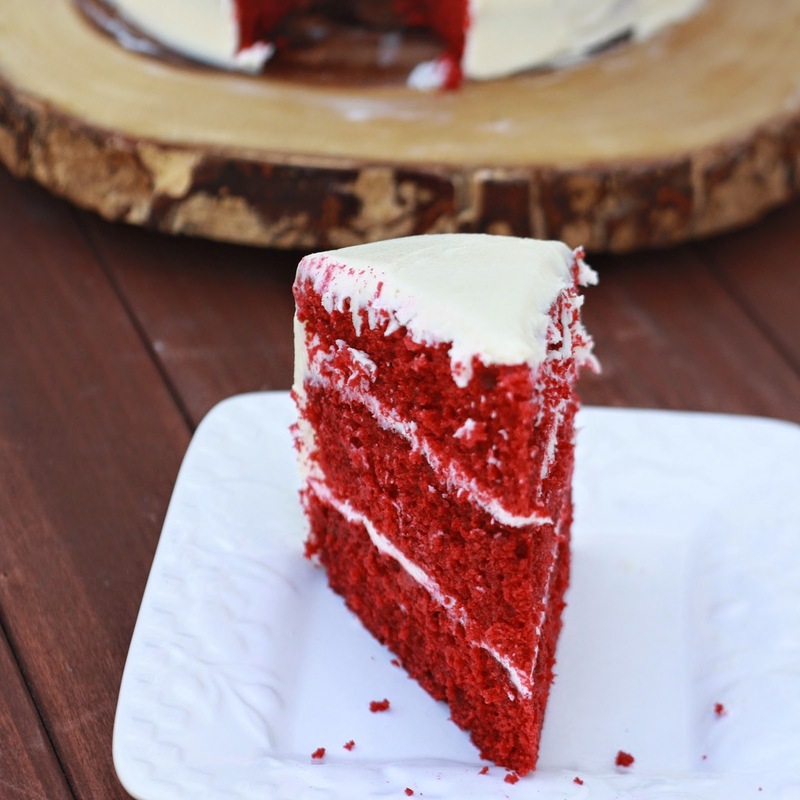 Place 1 cake layer on a cake plate and level off with a serrated knife. Add approximately 1/4 of the frosting to the top of this layer, spreading evenly. Top with a second layer, level, and repeat frosting. Finish with remaining layer, and frost the top and sides of the cake with remaining frosting. 6. Cover and chill for at least two hours to set frosting.